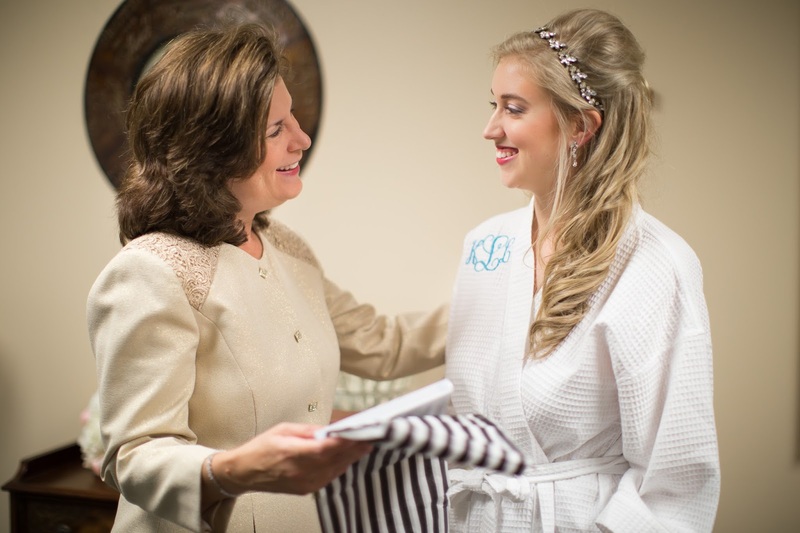 Don't forget to check out all of my wedding posts! 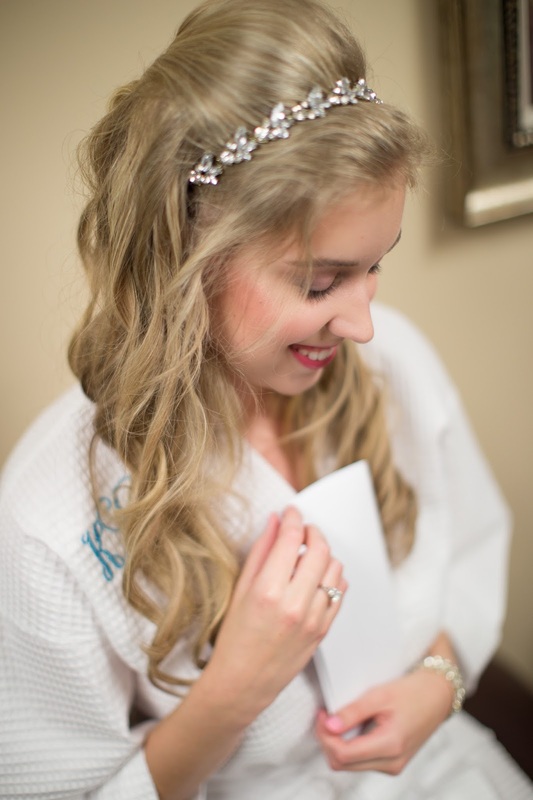 This week I wanted to share the morning of my wedding, getting ready before the ceremony. The day started pretty normal, I woke up feeling a little nervous, excited, etc. but mostly ready to just get the ball rolling. I wish I would have written this sooner because I already have forgotten some details. I'm not exactly sure what I did when I first woke up, but I know I had my hair appointment for 10am. My mom went with me to the hair dresser, we had done a trial run a few weeks before. 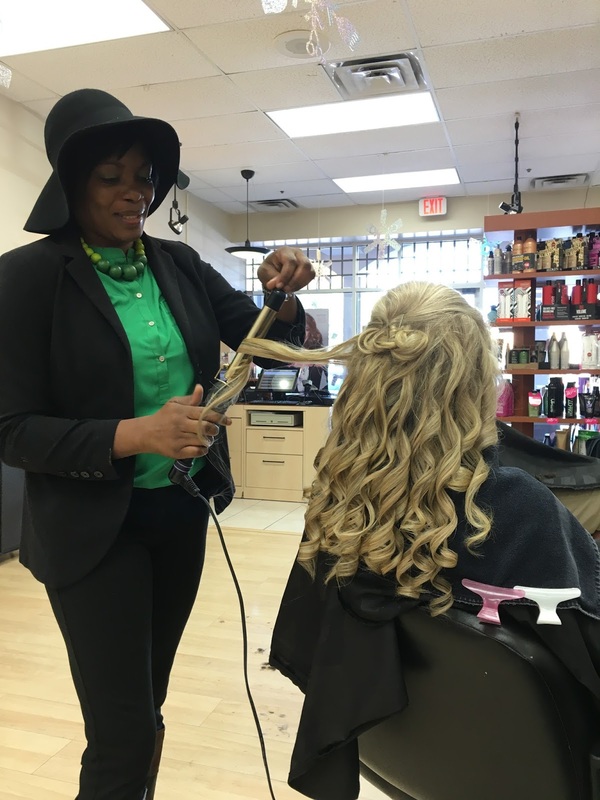 My super sweet hair stylist had gotten there extra early to heat up the curling irons and make sure she was all set for me! I was so touched by that! Here she is, almost done with all that HAIR! It turned out soooo good, you can't see my headband in this photo but you'll see it below. I was so happy with it, it was just what I wanted! After my hair was done and super hair-sprayed in place, we went home where my Dad had Panera waiting for us to eat for lunch. I was trying not to scarf down my food but I didn't want to waste any time. When I was done eating I got started on my makeup. I decided to do my own makeup for my wedding day because I love doing makeup and I know my face and what looks good better than anyone else does. After I did my makeup and my parents got all ready we headed to the church. Butterflies were full force at this point! I had about 40 bags it seemed like to carry in but as soon as we parked I saw my bridesmaids were already there (thank God for timely friends!) so they helped us carry everything inside. 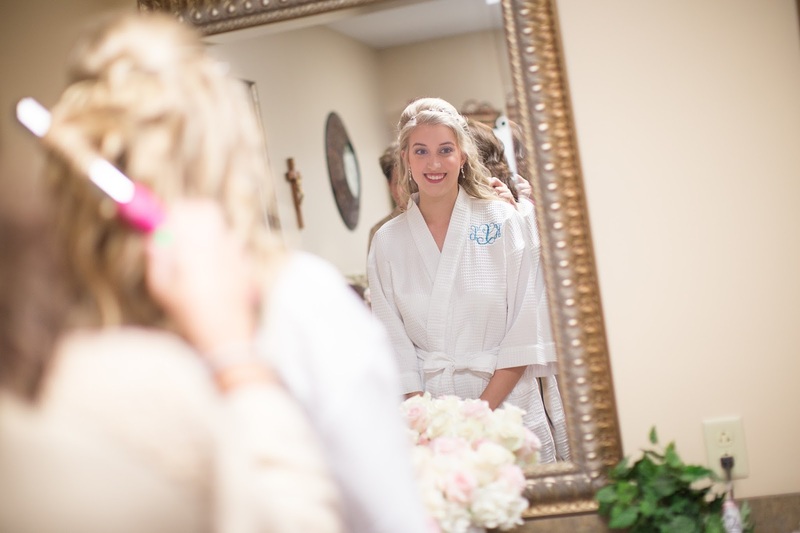 In the church there is a side room for the brides to get ready in, with its own bathroom and everything. It was really nice but I walked probably 50 times in a circle around the room as the time got closer! 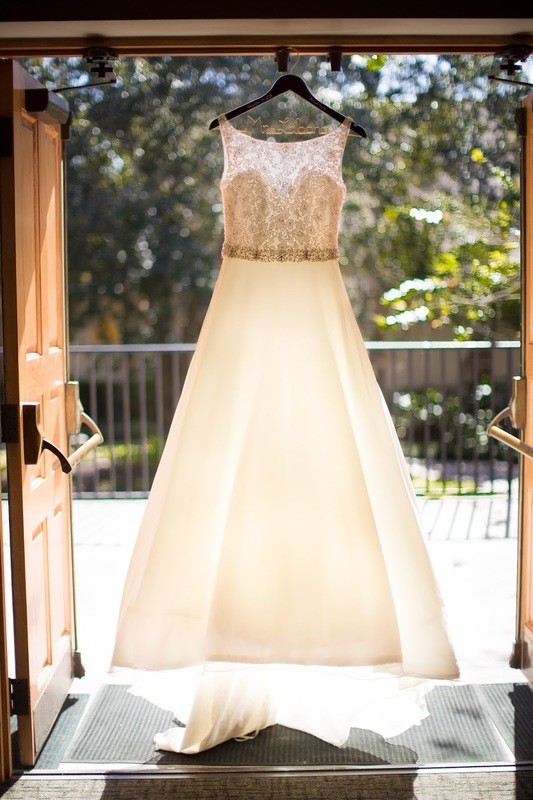 My photographers got there shortly after we got settled and got the most gorgeous shots of my dress! I love how the back shot makes it look like there's a heart! See it? 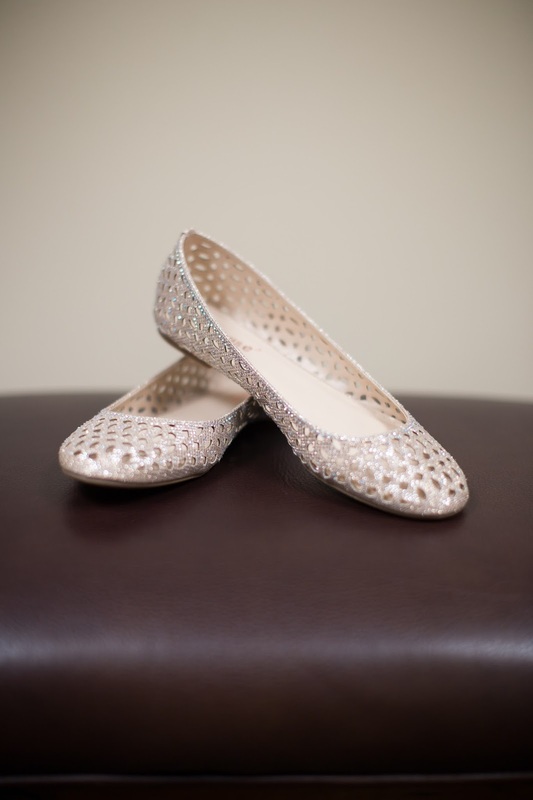 I wore flats because that's just what I do :) and so I didn't expect a super adorable 'shoe shot', but my photographer was able to get a great one! And guess what? Those shoes were like, $15 from TJ Maxx. You don't have to spend a lot of money to get nice things that work! They didn't hurt my feet all night! One of the groomsmen brought over a gift for me from my hubby to be. A charm for my Pandora bracelet he got me for our 3 year anniversary. 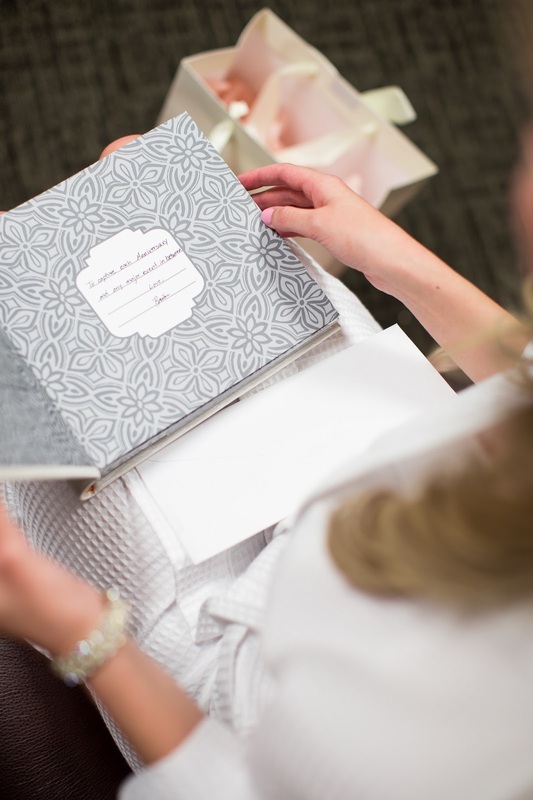 A photo album to fill with photos of all our future anniversaries. And a sweet letter I'll cherish forever. I also wrote him a letter, it's so hard to express such strong feelings in words, but we both did our best and we both know how much we love each other! My mom was running around putting up the decor we had for the church: pew bows, candles, programs, etc. But luckily she finished up and was able to come finish getting ready with me. I found this cute handkerchief (on Amazon of all places) that I thought was a sweet sentiment to give to my momma on my big day. I got to see my flowers for the first time when we got to the church. I was stunned! They were incredible, the picture here doesn't do them justice. 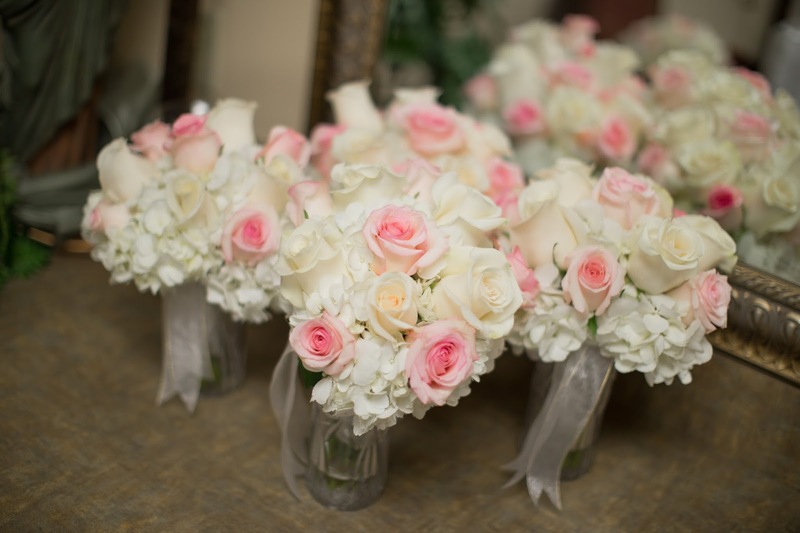 I have never seen more gorgeous, full, exactly-as-I-had-asked-for bouquets in my life! 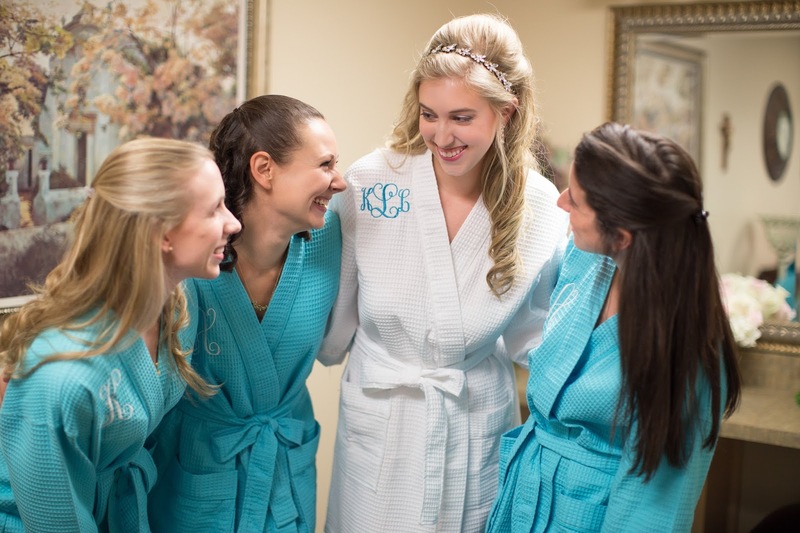 Part of my bridesmaid's gifts was a robe to get ready in - monogrammed by little ole' me (actually as you can see I'm not that "little" lol - so TALL!) :) They made for super cute pictures! 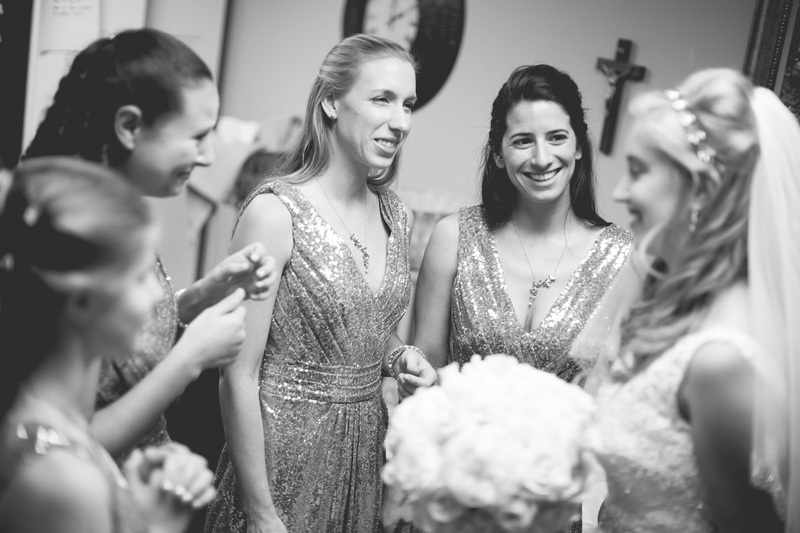 I also gave my bridesmaids a necklace and bracelet to wear that day in a personalized jewelry box. Sadly I don't have any pictures of those, it was just too crazy to catch every single detail. There did end up being a picture of my Jr. bridesmaid's gift though! 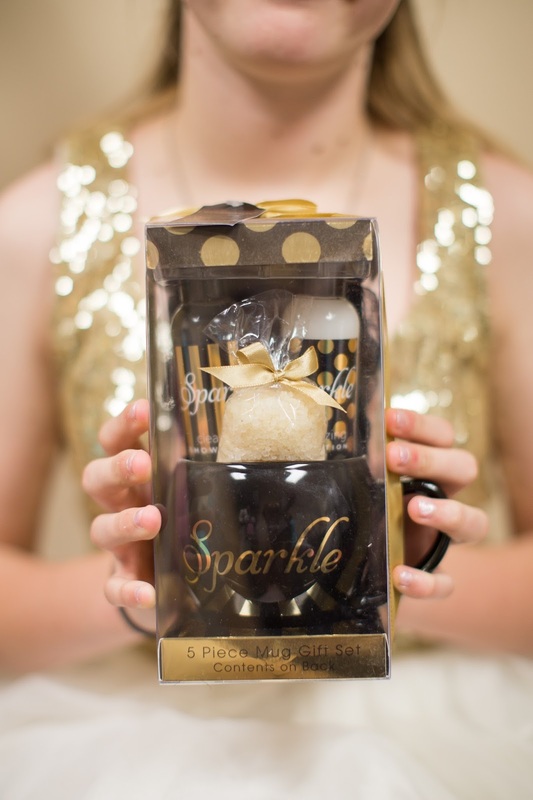 A sparkle mug filled with fun bath bubbles and salts. 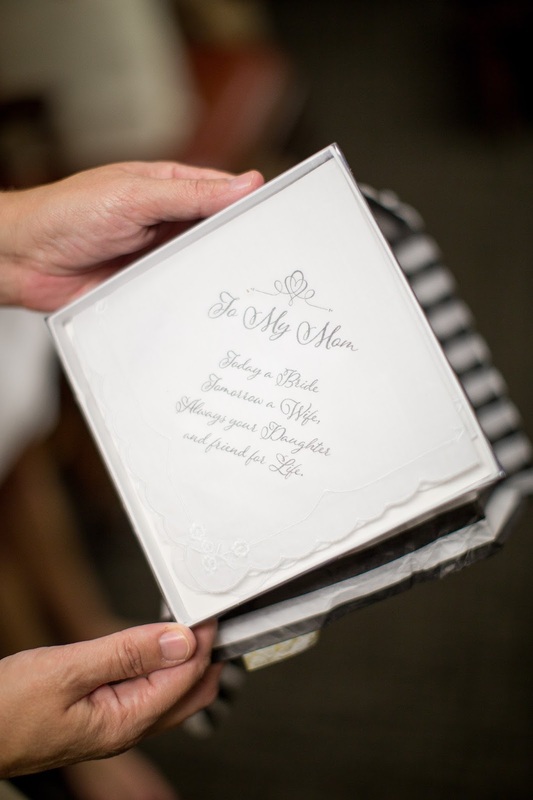 My wedding colors were black, white, and gold, so when I saw this I knew it was meant to be for her! I mean a sparkle mug, how perfect, right? My mom put some finishing touches on my hair while my bridesmaids got dressed. 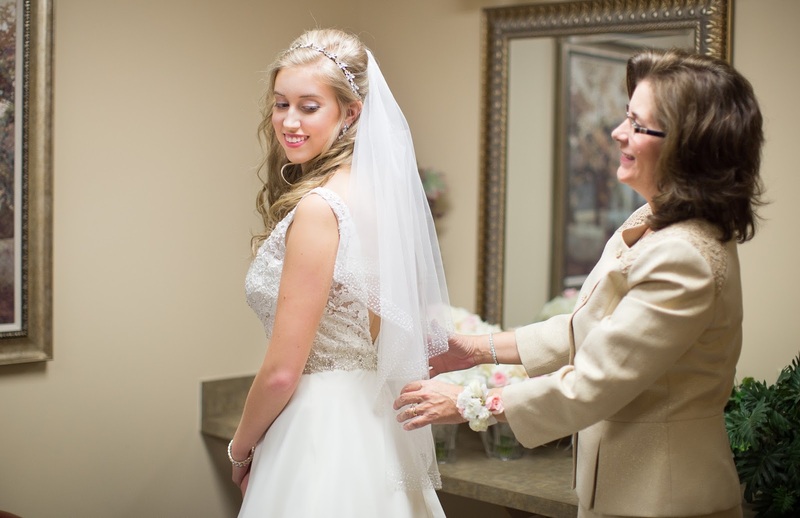 Once they were all good to go, my mom helped me put my dress on. 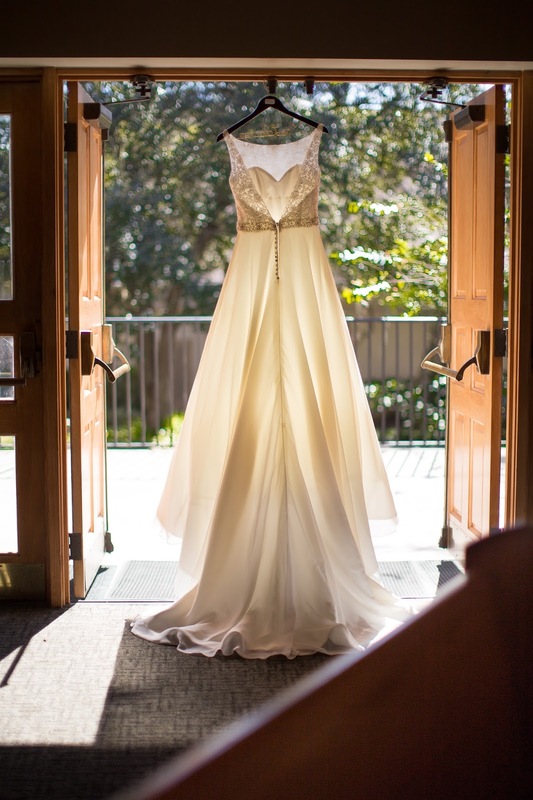 If you've ever put on a wedding dress then you know it isn't exactly your most graceful or elegant moment. Dealing with all those layers of tulle and organza, trying not to mess up your hair or makeup or step all over the dress. So as we're dealing with all that, my mom looks up at me and she gets tears in her eyes which of course makes me want to start balling! She said 'don't cry don't cry don't cry!' and we pulled ourselves together. It was a special moment that was just ours that I'll always remember. 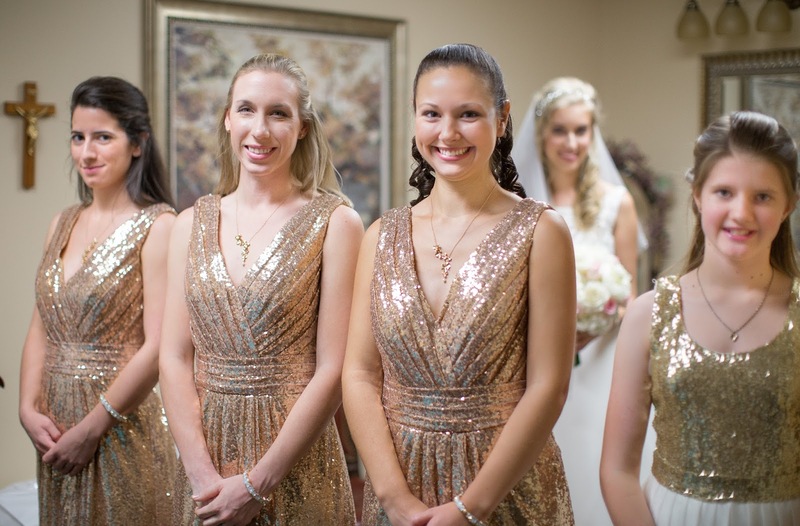 Once my dress was on and the fixing of the veil pictures were taken, it was time for the bridesmaids' first look! Thank God for these photos! Such a great idea of my photographer! Look at those priceless expressions. Love it. Love these girls more than they know for being a part of me and B's big day and our lives! My dad came in next - it was almost time! I was a wreck! 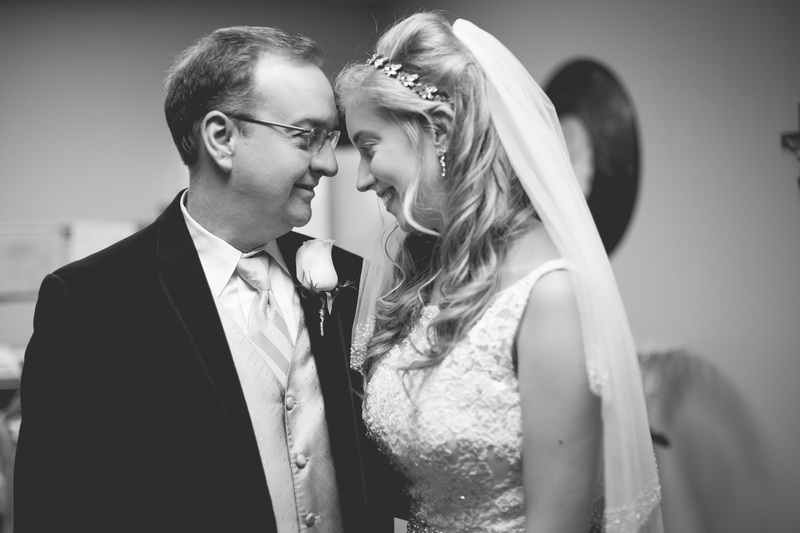 There is something about a girl and her daddy - just seeing him put me in tears. 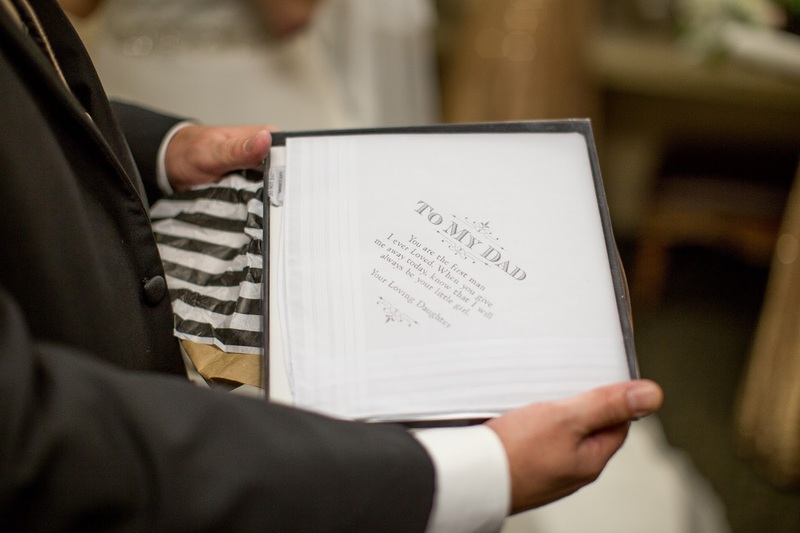 I got him a similar handkerchief, but with a special note for my Dad (get it here). I'll always be his little girl! After that it was time! 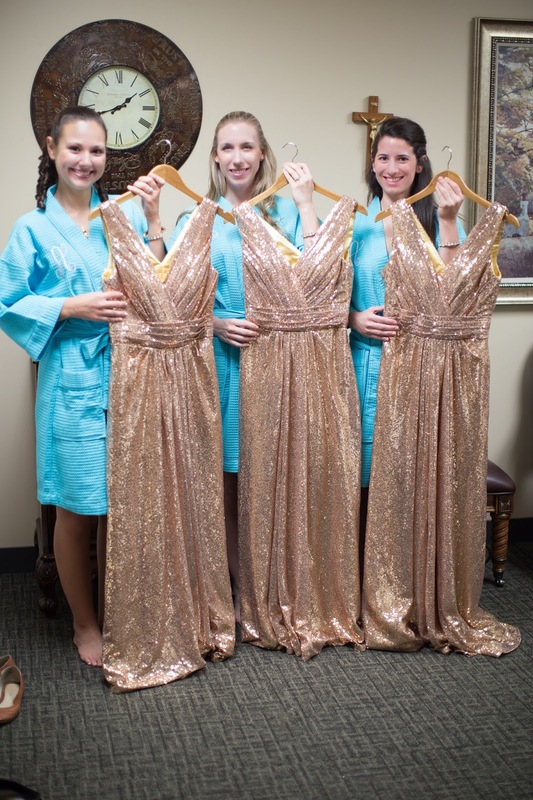 The bridesmaids all went out and lined up. I remember listening to the song we picked out for them to walk in to, wishing I could see what was going on. Then the music changed to my song. My heart was racing, this was the moment I had been thinking about for 7 years!! Luckily I had my dad there to lean on and hold tight to. Down the aisle we went! Next week I'll share about our ceremony! I hope you enjoy reading these posts! If they seem too long it's just because I want to read this in 10 years and remember as many details as possible. I always love reading wedding posts, so I truly hope you enjoy it too!